Norman Hurricane Smith "The Sound of The Beatles"
Beatle Bios have proliferated over the years from all quarters. They have ranged from boomers' nostalgia trips about what they heard/saw when perusing the original vinyl recordings to apparently heartfelt recollections from intimates and families of the Fabs. This is to advise of yet another Beatle Bio, likely one of the best of the lot for those interested in studio lore and history of the halcyon days at Abbey Road. 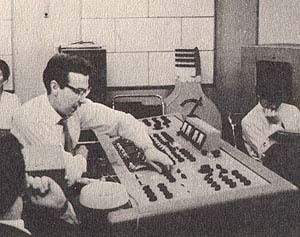 The story will be told by the legendary Norman Hurricane Smith, the Beatles' own engineer from their first EMI audition up to 1965's Rubber Soul including every single and album in between -- an amazing achievement and body of work by anyone's standards. As a fan and friend of Hurricane Smith of over 30 years' standing, I have lobbied my friend to put pen to paper and write this book since we first met in 1973. As you read this, Norman is putting the finishing touches on his book. due to appear at booksellers, worldwide, in June 2006. What makes this book different is its first-person quality from the man who was actually there with them and stretched all of the boundaries, whether it was working late into the night at Abbey Road to get the best mix possible, sorting out the mic'ing of a sitar or hauling out his soldering iron to suppress the vicious 50 hz. buzzing when the boys first dragged their beat-up road amps into the hallowed halls. Norman was there, not only as a board-op, tape operator or producer. He was there as an astute fellow musician, singer and composer as evidenced a few years later on his own blockbusting "Oh Babe, What Would You Say?" Coming to a bookseller near you, soon!